A lot of the Titans Return toys have been disappointing. Let's see if being more expensive makes them any better. Six Shot is the perfect weapon. He's ruthless, relentless, and built to eliminate anything that stands in his way. His power is matched only by his thirst for destruction. Revolver is one of the only bots who can keep up with him. A master of all combat types, he's trained to take down targets in any scenario. 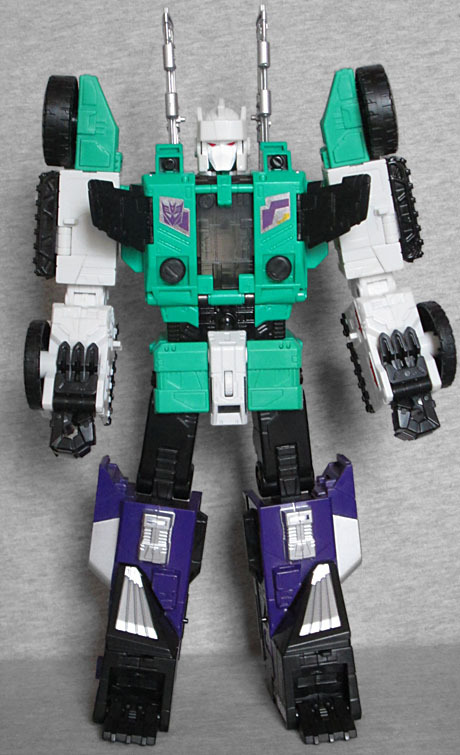 Sixshot was introduced in 1987, as a massive Transformer with six modes, and the modern version at least keeps the "massive" part alive. A Leader Class toy, he stands 9" tall even before you count the big silver wings on his back. He's mostly square and blocky, which makes him look strong. Or at least sturdy. There's some kibble scattered around, of course, but it's not like much of it is really identifiable as anything specific - he may have wheels and tank treads and wings coming out of his armpits, but it's not like there's an identifiable car hood or anything, you know? You look at him, and it's not immediately apparent what he turns into, and that's fun sometimes. Plus, they covered his exterior with simple geometric details that look like panels and hatches. 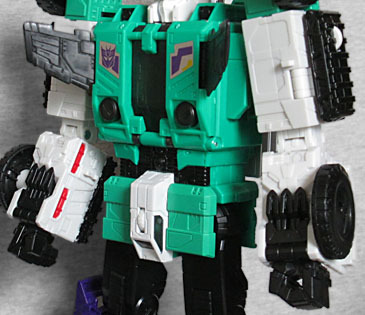 The old Sixshot was a giant brick, moving only at the shoulders. This new one (which parses the name "Six Shot," but who cares about that?) is much better! He's still got shoulders, but you can add a neck, biceps, elbows, hips, thighs, and knees to that tally. Due to the conversion scheme, the knees don't actually stop anywhere, so he might end up bending like an ostrich or something. Also, there are hinges in his ankles that make the feet tilt to the side, but the positions they move to are way too far for him to stand, and they're not used at any point during transformation. So what are they for? 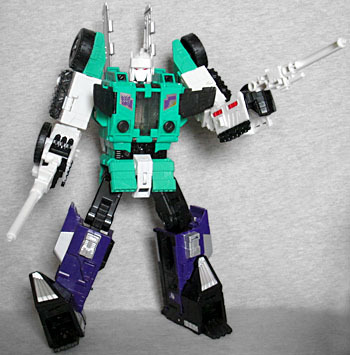 Sixshot was not a Headmaster before, but now he is. Why? Because that's this year's theme! Who cares if it adds no value to the toy! Since all the Titan Masters need to be interchangeable, they all need to be the same size, yes? But the head that fits a 5" tall robot definitely wouldn't look big enough on a 9" figure, so what is Hasbro to do? They're already putting the head inside a helmet, but that alone wouldn't be enough (as you can see if you try putting any non-Leader-Class head in there instead). Rather, they've designed it differently: while the smaller heads are complete heads, this is really just a big face; compare it to Darkmoon, Blunderbuss, Brisko, Grax or Monxo, and you'll see what we mean. In a cute touch, he has a headband with the Japanese character for "six" on it. 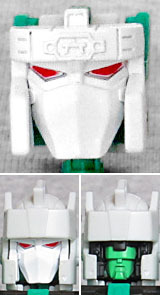 Remove the face from the helmet and unfold it, and you now have a tiny little robot named Revolver. Six Shot, Revolver... get it? Like we said, the original toy was not a Headmaster, so Revolver doesn't have any old version to update, allowing Hasbro to again get creative. 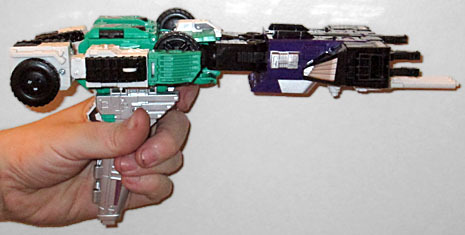 Sixshot featured fairly prominently in the Japanese Headmasters cartoon, which was never translated for the US. In that show, he was responsible for the kidnapping and torture of an Autobot named Jack; when he'd gotten all the information he could, he loaded Jack up with explosives and sent him back to the Autobots, who were forced to kill their friend before he could detonate himself inside Fortress Maximus. In a rather cruel or morbid twist of fate, Revolver's robot mode is based on Jack. We begin with what is apparently a tank. The only particularly "tanky" thing about it is that it has treads on the ground. 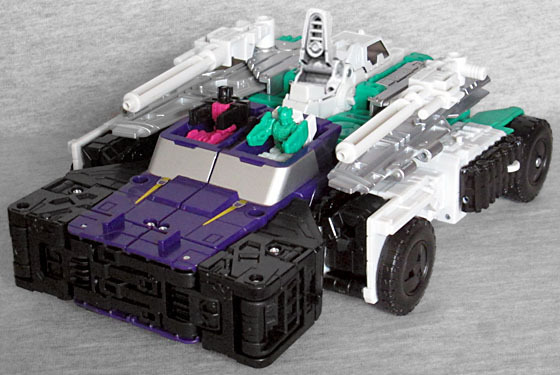 It has a wee glass cockpit for Revolver to ride in, which doesn't seem like a very good choice for an armored vehicle. 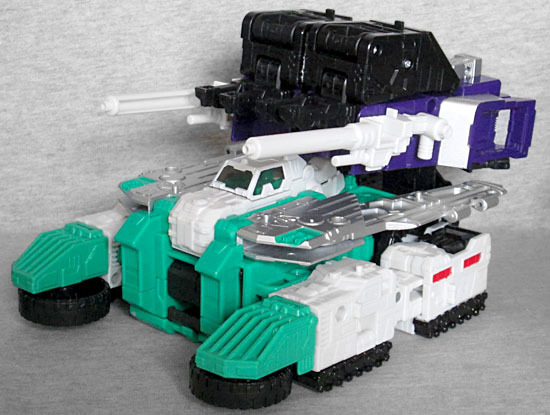 You can attach Six Shot's guns to the sides, but there's still no "central" cannon like you expect to see on a tank. 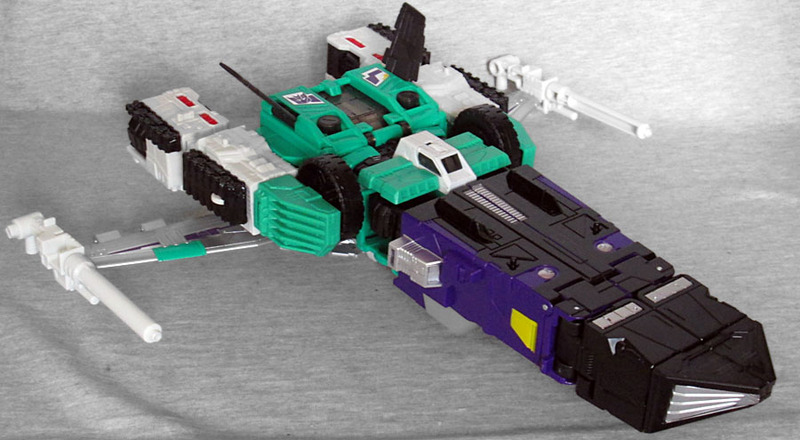 Like Blitzwing, Six Shot changes from a tank into a plane. This is a fancy jet, rather than anything realistic. The guns go out on the tips of the wings this time, and although there's a small cockpit, that's just decorative, and Revolver sits in what used to be the robot's chest (though you'll have to leave the hollow helmet hanging out). A piece unfolds from the bottom to serve as a landing gear. Next we have a car with seating for two! Revolver can bring someone along on a date! The hood hangs out pretty far beyond the front wheels, but the big square bulk up there and the guns mounted on the top give it a very "Mad Max" kind of feel. From there, we swing around and suddenly Six Shot is a wolf! A wolf with wings, but a wolf nonetheless. This mode is the reason the robot's knees can bend backwards, and the animal's jaw can open. 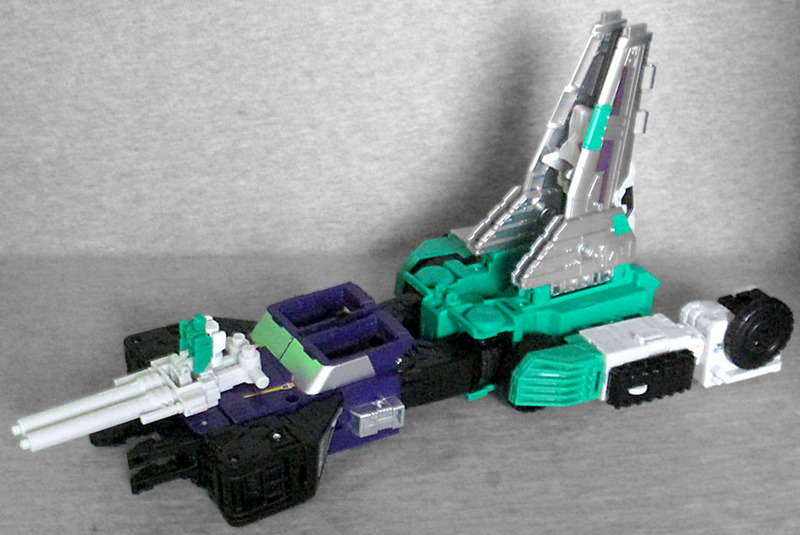 Revolver is meant to be in his head mode for this step, nestling in a hollow where the beast's brain should be. It sits up just high enough that you can make out the headband, too! 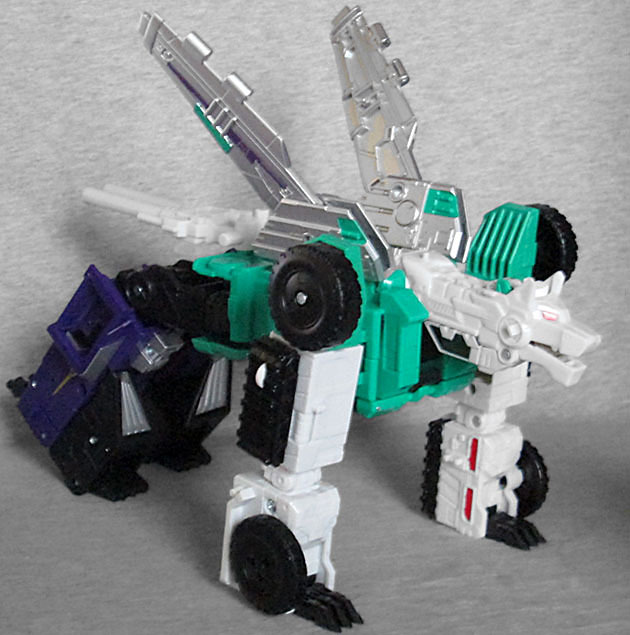 In this mode, the two guns plug together to form a very straight tail. And from there we go to the "submarine" mode. Yeeaahhh... right. A "submarine." The things that have thus far been wings lock into the sides of the wolf's head to create a sturdy con tower, while the guns stick off the front, providing a seat for Revolver. Hope you can hold your breath, little guy! This really isn't a terrific mode, it must be said. Almost as if they had a shape and just needed a name for it. Not all of Six Shot's half-dozen modes are winners, and remembering the specifics of where everything should be in every mode will take a little time, but you can tell a lot of thought went into this toy, and even though he's an expensive Leader Class figure, he's also the best Titans Return release we've reviewed yet!